The 22-year-old has taken full advantage of William Nylander’s absence by lightning the lamp while playing alongside the red-hot Auston Matthews. During the Leafs' convincing 4-1 win over the Los Angeles Kings, Kapanen put home goals three and four to start the season and his buddy/longtime teammate Garret Sparks, who led the way for the Buds with 33 saves on 34 shots, basically gave him the ultimate praise afterward by calling him “the fastest player on earth”. Garret Sparks on Kasperi Kapanen's recent success: "The obvious thing is, he’s the fastest person on Earth." So, if Kapanen's the fastest, what does that make Auston Matthews? "The most in control. Completely in control." That’s some pretty high praise, especially when you consider two of the world’s fastest in Edmonton Oilers superstar Connor McDavid and Montreal Canadiens speedster Paul Byron are also playing in Canada. 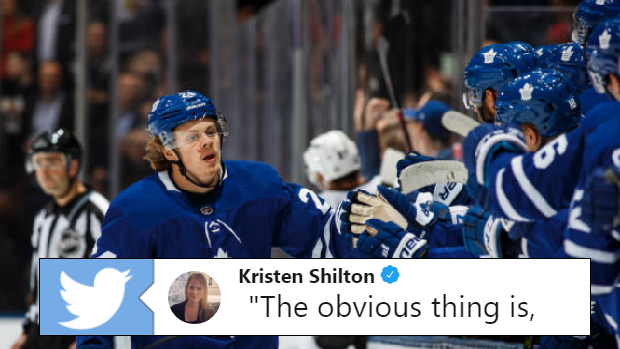 While some Leaf fans were loving it, others didn't seem to agree with the take. put him in a footrace with McDavid & Byron and he'll get the Bronze Medal. McDavid has managed to take home the last two NHL All-Star fastest skater awards, so this comment comes as a bit of a shock. But hey, maybe Sparksy was just trying to pump his teammate’s tires a bit?